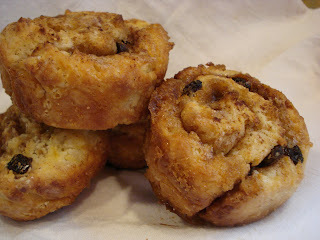 What interested me about this recipe from the March 2006 issue of Gourmet Magazine, besides the name, was the fact that the Ragamuffins took a fraction of the time a yeast dough cinnamon roll would take to make. I read all of the reviews that the recipe received and alot of bakers had good suggestions for adapting the original recipe, which I took into consideration when making mine for my March contribution for gourmetunbound. 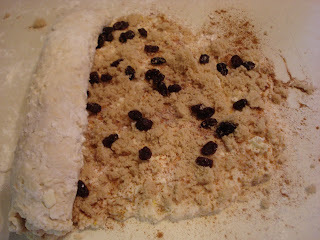 I didn't have maple sugar so I used granulated sugar, brown sugar and cinnamon and I threw in a few dark raisins. I also added some orange zest, remembering last month's recipe. Also, alot of reviews mentioned that the rolls unraveled during baking so I thought putting them into a muffin pan would help keep them together..and it worked! The dough is more like a biscuit dough than a light, fluffy yeast dough but, still, delicious. And any left over can be reheated and they're just as good as first baked. So, if you'd like to whip up a quick breakfast treat, this one would be great. One last afternote, I think an orange glaze would really make these extra special! 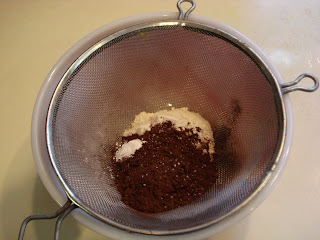 Throw the flour, maple sugar ( if using), baking powder and salt into your food processor and pulse to combine. Then add the cold butter and pulse til consistency is like coarse meal. 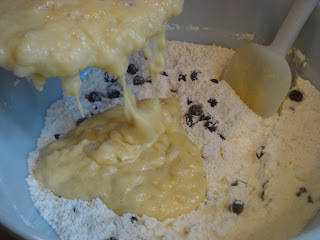 Transfer to a large mixing bowl and add zest ( if using) and milk and stir with a fork til a shaggy dough forms. Dump the whole mess onto a lightly floured surface and gently knead a few times. Roll out the dough to a rectangle and spread with the softened butter and sprinkle with maple sugar ( if using), or your cinnamon sugar mixture. Throw in some raisins and/or nuts if you'd like. Roll up the dough and cut slices about 1" wide. You should get about 12 slices. 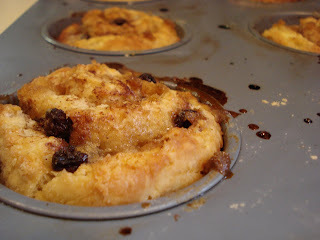 Here's where I changed the recipe and used muffin pans. 1 cup granulated maple sugar ( or substitute a mix of white granulated sugar, light brown sugar and cinnamon)*Note: You could also add some nutmeg and/or chopped nuts. 1. Whisk, (or place in food processor), flour, maple sugar, baking powder and salt. 2. Blend in butter with fingers ( or processor) til it resembles a coarse meal. 3. Transfer to large bowl ( if using processor), and add milk and stir with fork til a shaggy dough forms. 4. Gently knead 8 to 10 times on a lightly floured surface. 5. Roll out to a 13" x 11" rectangle. Spread evenly with softened butter ( you can see from my photo that it kind of went on in clumps but don't worry, it all comes out okay!). 6. Roll up snugly. 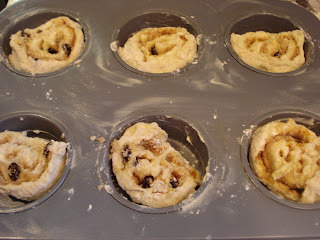 Cut into 12 slices and arrange cut slices down on baking sheet ( or place in the muffin pans). Sprinkle top with some remaining maple sugar mixture. 7. Bake til puffed, 18 to 20 minutes. If you want to make an orange glaze, mix some confectioners sugar with some orange juice and a little bit of orange zest to a smooth, thin consistency and drizzle over slightly warm muffins. I had been thinking about making banana bread for a while and, as usual, my local grocery store had plenty of over ripe bananas, wrapped and ready to come home with me. I love that they sell fruits and veggies that are just past ripe at a fraction of the original cost. Some stores don't do that. I'm told they just throw them out! It seems so wasteful. Anyway, I thought I'd try a few different recipes and see which I liked better. The first one is from Molly Wizenberg. I believe she has it in her book " A Homemade Life", which I really want to get around to reading some day soon! But I found the recipe here. It sounded a little bit different, with the addition of crystallized ginger and chocolate chips. I baked another recipe to compare and I'll try to post that one tomorrow..not promising! I really liked this banana bread. It doesn't have any spices in it, such as cinnamon or nutmeg, like the other one. Kris really loved it! 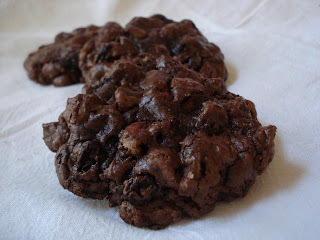 I did love the chocolate chips and the crystallized ginger gave it a little chewiness. One change I had to make was that I bought a low fat yogurt by mistake so all I had in the fridge to use was creme fraiche that I'd made and that worked just fine. Banana bread is an easy recipe to make because you do all the mixing in just a few bowls and it's all mixed by hand so you don't even have to drag out the big mixer. Just combine all the ingredients together and stir. Then throw in the dry and stir gently til it's all combined. Pour the batter into your prepared pan and bake. 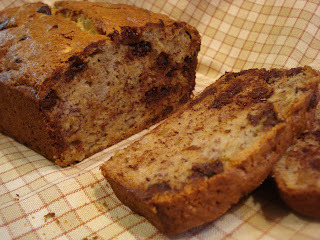 Banana Bread with Chocolate and Crystallized Ginger ( adapted from Molly Wizenberg's book). Preheat oven to 350. Butter a loaf pan. 1. Melt the butter and set aside to cool. 2. 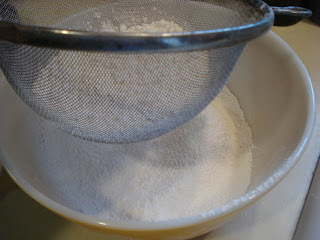 In a large mixing bowl, whisk the flour, sugar, baking soda and salt. 3. 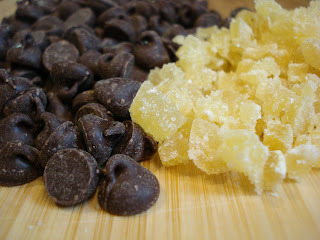 Add the chocolate chips and crystallized ginger. Stir well and set aside. 4. In a medium bowl, lightly beat eggs with a fork. 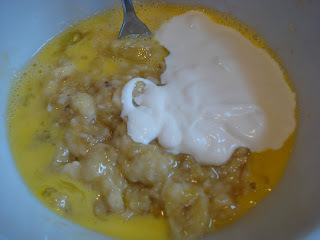 Add banana, yogurt, butter and vanilla. Stir well. 5. Pour banana mixture into dry ingredients. Stir gently til just mixed. Batter will be thick and somewhat lumpy but all the flour should be incorporated. 6. Scrape into prepared pan and smooth the top. 7. Bake 50 minutes to an hour or when a toothpick inserted in the center comes out clean. If the top is getting too browned, tent top with foil. 8. Cool in pan 5 minutes. Then take out of pan and cool completely before slicing..if you can wait that long! When I read this recipe in the King Arthur Flour Cookie Companion and saw that it originally was from Nanaimo, a city on Vancouver Island in British Columbia, I thought it would be a perfect choice, kind of my nod to the Olympics! I hadn't even looked up any info on this bar or noticed how many others had baked it and commented on it before I had made it myself. Then, after I had made it, I checked it out on line and saw many variations, the peanut butter one sounds good! Or, how about using mint flavor? I couldn't wait to taste it and once it had done time in the fridge, I took it out to take a photo and took a bite. It really has a nice, creamy texture from the pudding filling and the chocolate layer on top adds a wonderful chocolatey silkiness ( using semi sweet Belgian chocolate doesn't hurt, either!). The only objection I have it that the bar seems very elegant and the graham cracker crumbly crust doesn't seem to go with the two top layers. It seems to need a less crumbly, more sophisticated crust, maybe something like a chocolate shortbread? The flavors and textures are better, I think, if the bar is at a cool room temperature, rather than straight from the fridge. 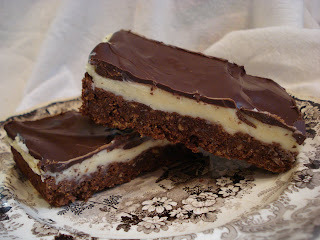 So, let's make Nanaimo Bars. First make the crust by combining butter, sugar and cocoa in your mixing bowl. Mix in egg and stir in coconut, walnuts, vanilla and crumbs. Pat the dough into your prepared pan and bake 10 minutes. Once it bakes and cools, make the filling and spread over top and refridgerate til chilled. 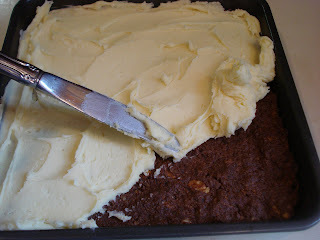 Once that has cooled, make the frosting and spread that over the top and refridgerate again til set. Kind of alot of steps! 1/2 cup chopped walnuts ( the recipe didn't specify how finely chopped but I took mine for a spin in the food processor til they were finely chopped). Preheat oven to 350. Lightly grease a 9" x 9" pan or an 11" x 7" pan. 1. 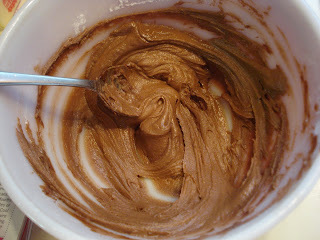 In medium sized mixing bowl, combine butter, sugar and cocoa. 2. 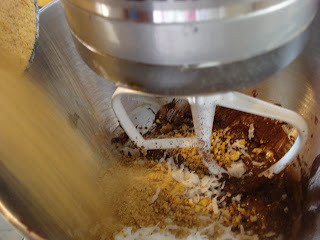 Mix in the egg, then stir in the coconut, walnuts, vanilla and crumbs. 3. Press the mixture into the prepared pan and bake 10 minutes. 4. Remove from oven and allow to cool completely. 1. In medium sized mixing bowl, cream butter, then add 1 cup confectioners sugar and the vanilla. 2. In a small bowl, stir the pudding into the milk and add to the butter mixture. 3. Add the remaining cup of confectioners sugar and beat til the filling is smooth. 4. Spread it over the cooled crust and refridgerate til cooled. 1. 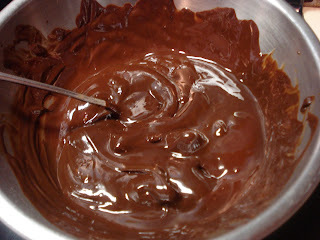 Melt the chocolate and shortening in a small saucepan set over medium heat or in the microwave. ( I used the double boiler method). Stir til smooth. 2. Spread the frosting over the chilled bars and refridgerate til chocolate is set. 3. Cut into bars, using a very sharp knife. I have the very good fortune to be set up on the weekend indoor Farmers Market in Stockton, NJ next to the fabulous Owowcow Creamery , selling some of the best..no..make that the best ice cream I have ever tasted. Their ice cream is made in small batches from local, all natural ingredients and the owner, John makes it all himself. The flavors are just amazing and I get to sample everything! They even pass out the almost empty containers for us all to polish off! Well, last weekend, John made a Chai Cream flavor ice cream that he gave me to sample. It is my new favorite flavor, so far with the Pistachio Raspberry running a close second! But this Chai flavor inspired me to seek out a Chai Shortbread Cookie and I found this recipe on the Culinaryinthedesert blog which is from a Land O Lakes recipe, so he states. I made half the recipe, to be sure the cookie wouldn't come out too hard for a sandwich cookie. I find that if a cookie that's made to take a filling is too hard, once you bite into it all the filling gushes out. Well, this cookie was just right. 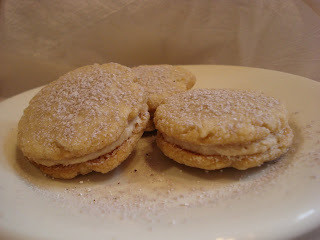 Using only confectioners sugar, it is soft enough to take the filling but not too soft for a shortbread. 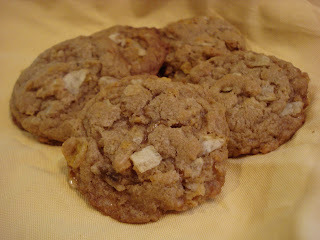 The flavors of the chai really came through and the filling adds a kind of creaminess to the cookie. I think I'll try adding a little star anise to the next batch since it's another one of the ingredients in chai and not listed in this recipe. Now that I have this recipe, I'm going to adapt my toasted coconut shortbread recipe and then I can incorporate a lime filling..Yum! Stay tuned! Preheat oven to 325. ( I bake mine in a 350 oven and it was fine). Generously sprinkle granulated sugar on baking sheets. 1. In a medium bowl, whisk flour, salt and spices. 2. In a large bowl, beat butter and sugar til light and fluffy. 3. Add the dry ingredients and mix til all is combined well and begins to clean the sides of the bowl. 4. 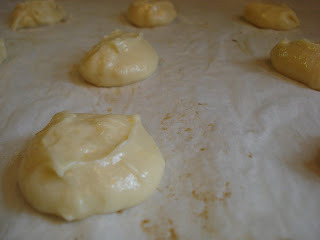 Shape dough into 1" to 1 1/2" balls and place on baking sheets. Flatten each one with a flat bottom glass dipped in sugar to 1 3/4" in diameter. 5. Bake 10 to 14 minutes. Cool completely on wire rack. 6. 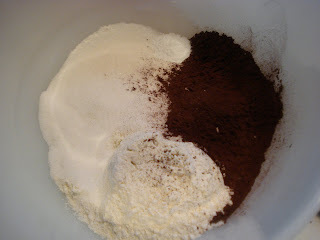 Filling: Stir half & half and espresso powder together in a small mixing bowl. Beat in confectioners sugar, a little at a time, then beat in butter and spices. Beat til smooth and creamy. 7. Add a teaspoon size dollop of filling onto one cookie and top with another. 8. 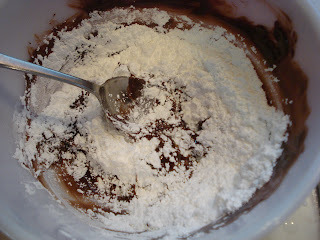 Topping: In a small bowl, stir confectioners sugar and cocoa together. Sift over sandwiched cookies. I noticed this cookie recipe from the King Arthur Flour Cookie Companion Cookbook a while ago but I was in a hurry at the time and the one thing that kept me from making it then was the fact that there wasn't an egg in the recipe. Now, sure, I know, tons of cookie recipes don't include eggs, but not this kind of cookie recipe. So. that's why I put off making them til today. I reread the recipe again, reading the directions also but didn't find any egg listed or used so I called King Arthur Flour in Vermont to ask..what's up with this recipe? And, sure enough, it was a typo! So, if you ever decide to make the Toffee Crunchers from their book, page 263, to be exact, remember to add one egg! Or just go with my recipe below. The original recipe called for light brown sugar, but I only had dark brown so I used that instead. I don't know what difference it made..and I won't know til I make them again using light brown, but I don't think it changed the recipe that much. What I liked about the cookie was that it has a wonderful toffee flavor and it's not too sweet, since there's no white sugar used. And it's rich, buttery and chewy and the potato chips add a little salty crunch. I used a small cookie scoop to form them and they came out about 3" across. The recipe also said to space 2 1/2" apart on the sheet because they spread, but I didn't find that they spread much at all. 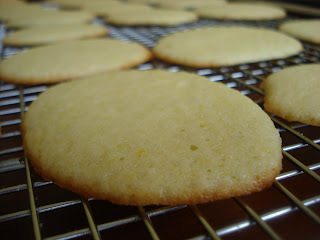 I think next time I make them, I'll make them bigger, using the large cookie scoop. It's an easy recipe, too. Just cream the first 6 ingredients in a mixer bowl. Then add the egg and the flour. 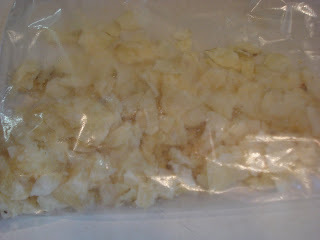 I crushed the potato chips in a zip lock bag. And added the crushed potato chips, cornflakes ( which I just crunched in my hands as I added) and toffee bits. Then stir all the add in's into the dough ( I used my paddle. I tried mixing by hand but the dough was too stiff). Mine didn't spread as much as the recipe said they would. Preheat oven to 375 and line baking sheet with parchment paper. 1. In a large miing bowl, cream together butter, sugar, salt, vanilla, baking soda, baking powder. 2. Mix in the egg, then the flour then gently stir in the add ins. ( I had to use the paddle attachment on my standing mixer again to mix til just combined). 3. Drop the dough by the tablespoonful onto prepared sheet spacing about 2" apart. 4. Bake for 10 to 12 minutes. ( Mine only took 10 minutes. )** Update** I checked the texture of the cookies after a few hours and they seemed a little dryer than before, so I suggest baking 8 to 9 minutes for a chewier texture). 5. Remove from oven and cool 5 minutes on sheet. Transfer to wire rack to cool completely. 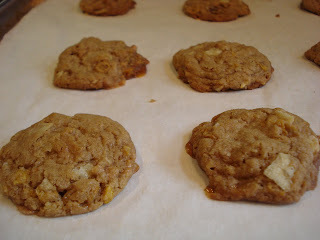 You can substitute 2/3 cup butterscotch chips and 2/3 cup chopped pecans for the toffee bits. You can substitute 2 cups gently crushed cornflakes for the rice cereal. I tried very hard to get this recipe posted yesterday, as promised, but when I sat down at the computer at 10 o'clock last night, not only did I have trouble forming words into sentences, but I could barely keep my eyes open. Okay, enough excuses! This recipe is from The King Arthur Flour Cookie Companion Cookbook. It combines the flavors of coconut and lime and makes a wonderfully refreshing bar cookie. A kind of sweet and tart combo that is so very good. As a matter of fact, everyone who tried it today just loved it, so don't just take my word for it! 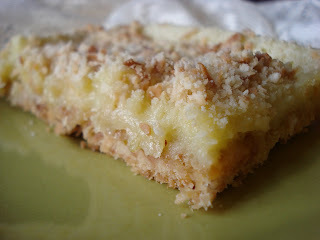 I especially love the crunch of the toasted coconut in the crust. I made one small change to the filling, which was to add some lime zest to give it more "punch". I halved the recipe and used a 9" square pan. Begin by combining all the crust ingredients in a food processor, reserving 1 cup for the topping and press into the bottom of your pan and bake. Make the filling and pour onto the crust. Bake the bars and sprinkle on the reserved crumbs. bake another 10 minutes and that's it! Let it cool 1 hour and chill. Preheat oven to 350. Lightly grease a 9 x 13 inch, 11 x 11 inch or similar sized pan. 1. Combine all the crust ingredients in a medium sized mixing bowl or in the bowl of a food processor. 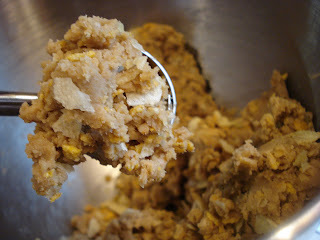 Mix or process til mixture is crumbly. 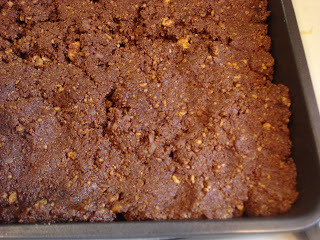 Set aside 1 cup of the crumbs and press the remaining crumbs into the bottom of the pan. 2. Bake 16 to 18 minutes, til it's golden brown. 1. In a medium sized bowl, beat the cream cheese til soft. Add the sugar and salt and beat til well blended. 2. Stir in the flour, then beat in the eggs, one at a time, beating well after each addition. 3. Stir in the lime juice ( and zest if using) mixing til smooth. Pour onto the crust. 4. Bake the bars for 15 minutes. 5. Sprinkle top with reserved crumbs and bake an additional 10 minutes or til set around the edges but still slightly wobbly in the middle. 6. Remove from oven and let cool at room temp. for 1 hour. 7. For easiest slicing, refridgerate for several hours. The cold weather and snow still everywhere in sight makes me want to bake some lemon and lime flavors, with a little coconut thrown in! Maybe I can't be surrounded by warm ocean breezes and gently swaying palm trees but I can sure make some flavors of the tropics! And you know I have plenty of lemons hanging around. I actually made 3 different recipes using coconut, lime and lemon. The first was a toasted coconut shortbread cookie, using my basic shortbread cookie recipe, I just added some toasted coconut and a little coconut extract. It turned out great and I'll post the photos and recipe in a day or 2. 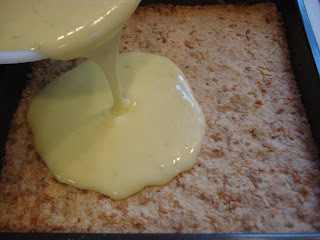 The second recipe, from The King Arthur Flour Cookie Companion, is Key Lime Bars in Coconut Crust. This one ..tomorrow! Today, Lemon Whoopie Pies. I've made pumpkin, chocolate and even zucchini whoopie pies before and I was looking for some different flavors for the cookie when I came upon this recipe. And still having my seemingly endless supply of lemons ( I think they're multiplying in the fridge! ), I chose these light, delicate, lemony, ethereal ( don't you love that word! 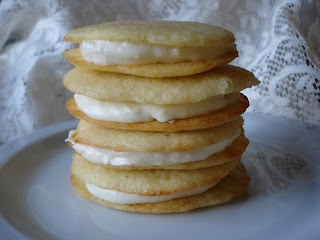 )whoopie pies and found another recipe for the lemon filling. So, if you live in a cold climate..or not, these lemon whoopie pies will definitely brighten your day! Begin by sifting the dry ingredients into a medium bowl. In a large bowl, beat the butter, sugar and lemon zest til smooth. Add the egg, lemon juice and vanilla. Add the flour and buttermilk alternately. I wanted my cookies on the smaller side so I used a small cookie scoop. If you want larger cookies, just use heaping tablespoonfuls. Place them 3" apart on the baking sheet. They don't get high and fat like the chocolate whoopie pies. These are delicate and airy. Let them cool completely before putting the filling on top to make a sandwich. Lemon Whoopie Pies ( adapted from recipe from joythebaker, who got it from the Big Fat Cookie Book) Makes 8 giant cookies or about 15 smaller cookies. Preheat oven to 350. Line 2 baking sheets with parchment paper. 6 tbsp. unsalted butter, room temp. 1. Sift flour, baking powder, baking soda and salt in medium bowl and set aside. 2. 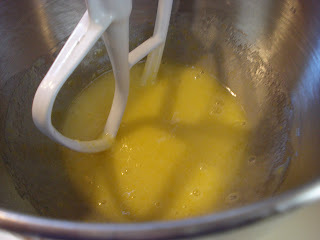 In a large bowl, using an electric mixer, beat on medium speed the butter, sugar and lemon zest til smooth, about 3 minutes. Scrape sides of bowl occasionally with spatula. 3. Add egg, lemon juice and vanilla, mixing til blended, about 1 minute. ( Batter may look curdled). 4. On low speed, add half the flour mixture , mixing just to incorporate it. Mix in the buttermilk. 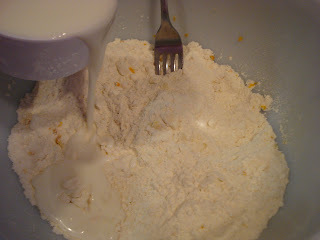 Mix in remaining flour mixture just til it is incorporated and the batter looks smooth again. 5. Drop heaping tablespoonfuls onto prepared sheets placing 3" apart. For smaller cookies, use heaping teaspoonfuls or a small cookie scoop. 6. Bake one sheet at a time, about 12 minutes, checking after 10 minutes. The cookies will be slightly browned along the edges but not on top. 7. Remove from oven and let them cool on the baking sheet 10 minutes, then using a wide, thin spatula, transfer them to a wire rack to cool completely. 1. Place the softened butter in a medium bowl and beat til smooth. 2. Add the confectioners sugar, starting with 2 cups, and beat til smooth. 3. Add the lemon juice and zest, adding more confectioners sugar or juice as you stir to get the correct consistency for a nice, smooth but not too thin filling. Spread filling onto one cookie and top with another. If you're ever in a hurry to make something that's quick to make, rich, buttery, chocolatey and nutty..this is the recipe you need! It's chewy and crunchy and just so darn good! And this is exactly the recipe I made early Sunday morning, after selling out the day before of all my goodies. Saturday, the first half of our Valentine's Day weekend indoor market day was so busy that I had to come home and start baking all over again! 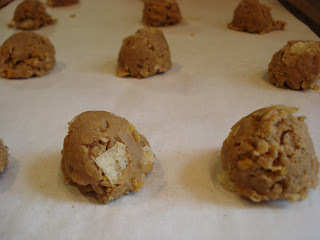 So you can imagine I was desperately needing some quick and yummy cookie ideas to bake. 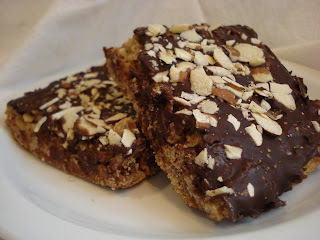 I've made this bar cookie before and remembered that everyone loved it. Well, since I'd been up since 4 AM that morning, I felt I deserved to turn off the oven by 10 PM and resume the baking marathon, round 2, early Sunday morning. So that's when I remembered this recipe and threw it all together in record time. The chocolate wasn't even set on top as I packed it into the car. But, I sold almost all of it, keeping 2 pieces aside (to show you!). The recipe is originally here , from Better Homes and Gardens, but I first noticed it here , on the Cookie Madness blog. Give the recipe a try..even if you're not in a hurry ! 1 12 oz. pkg. semi sweet chocolate chips ( I used chopped dark Belgian chocolate because that's all I had). Preheat oven to 350. Spray a 15" x 10" pan ( I used a glass pyrex dish) lightly with veg. spray and line with foil, extending ends beyond pan ( to make it easy to lift out). Spray the foil, very lightly with the veg. spray. 1. 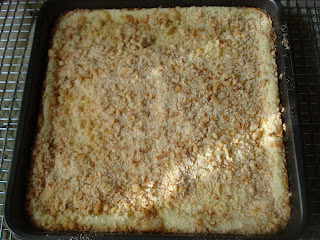 Arrange the graham crackers, closely, in a single layer on the bottom of the prepared pan. 2. In a large bowl, combine oats, sugars and flour. 3. Add the melted butter, egg and vanilla and stir to combine well. 4.Spoon mixture over grahams and spread evenly to edges, covering all the grahams. 5. Bake 20 to 25 minutes, or til mixture starts to bubble and looks lightly browned ( mine took a little more than 25 minutes). 6. Take out of the oven and immediately sprinkle the chocolate over the top. Return pan to oven for 1 minute, then spread the melted chocolate with an offset spatula to cover all the oat mixture. 7. Sprinkle with the almonds. crushing the nuts with your hands as you sprinkle over the chocolate. Cool in pan on wire rack. * To make it easier to cut into neat squares, before I refridgerated the bars, I scored each piece, using a sharp knife ( I was in such a hurry that I used a pizza cutter, which worked but got a little gloppy). Don't try to cut all the way through, just enough so that when the bars are chilled, you can cut them into nice clean squares. * Once tey've cooled and have been scored, place in the fridge about 30 minutes to set up completely. I've noticed a lot of "buzz" lately online about a new venture called the Cookiebar that Dorie Greenspan and her son have started. All this publicity reminded me that her cookie recipes are awesome, amazing, award winning..and just downright delicious! So, being almost Valentine's Day and needing more chocolate cookies to make, I proceeded to bake her Chocolate Chunkers and let me just say..WOW! Now, I'm sure many of you out there have already made them, but for those of you who haven't, you really need to go into the kitchen and make them now! There are 4 kinds of chocolate involved, semi sweet, unsweetened, bittersweet and milk or white. In addition to all that chocolate, you can throw in whatever you like for dried fruits, such as raisins, dried apricots, or maybe even dried cranberries or cherries. And any kind of nut you prefer. I used raisins and pecans and semi sweet chocolate chips instead of white chocolate because alot of people don't like white chocolate, for some crazy reason. I baked a test batch first, to see how they come out, such as, do they spread, do they take longer than the stated 10 to 12 minutes. Here's the results. I found is that you really need to almost form them with your dampened fingers to make them into nice rounded shapes. I used just a regular tablespoon and scooped a generous amount of dough. You also need to flatten the mounds slightly before baking because they don't spread much at all and you don't want them to wind up still in a mounded mass when through baking. And lastly, mine took a few minutes longer, more like 13 minutes. They still looked wet in the middle after 10 minutes, for sure, and I would keep checking after 11 to 12 minutes. She does state in the recipe that if, when the cookies are cooled, the chocolate is still gooey, pop them into the fridge for 10 minutes if you want them a bit firmer. So to begin, sift your dry ingredients. 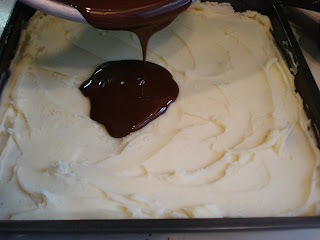 Using the double boiler method over simmering water, place the butter pieces, bittersweet chocolate and unsweetened chocolate and heat, stirring occasionally,just til melted. The chocolate and butter should be smooth and shiny but not so hot that the butter separates. Remove the bowl from the heat and set it aside to cool. In your standing mixer with the paddle attachment, beat eggs and sugar on medium high for 2 minutes, til pale and foamy. Beat in the vanilla, scraping down the bowl as you go. 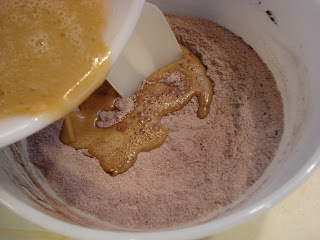 Reduce the speed to low and add the melted chocolate/butter mixture. 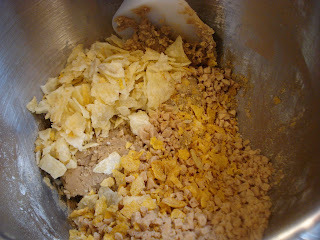 Then add the dry ingredients, mixing just til the dry disappears into the dough. The dough will be thick, smooth and shiny. Mix in the semisweet chocolate and milk (or white ) chocolate chunks, nuts and raisins( or whatever dried fruits you choose). The dough will be very chunky and stiff at this point. 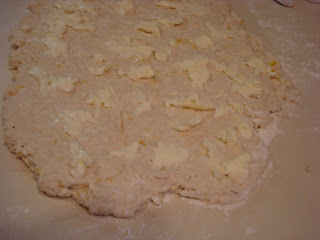 Scoop the dough with your tablespoon and drop onto the prepared baking sheet, spacing 1" apart. Form each mound into a somewhat round shape and with slightly dampened fingers, flatten each one slightly. Bake 10 to 12 or 13 minutes. Check them after 11 or 12 minutes. Mine took more like 13 minutes. But remember, you don't want to overbake them and they do firm up as they cool. 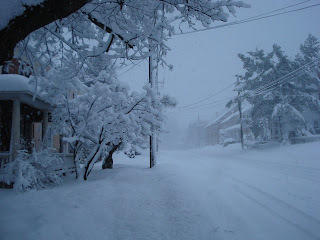 And as for this snowy scene outside my front door yesterday..I can honestly say I've had enough snow, already!! I had to actually climb out a second floor window this morning to try to shovel snow off my porch roof. Can you believe it? My neighbor was calling up to me, telling me I needed to get the snow off my roof because it was so heavy. Well, I couldn't shovel it off and there it remains. I'm waiting to hear a loud crash! Anyway, let's get to the recipe! Made almost 24 cookies, may make a full 2 dozen but it depends on the size you make them. 1 cup moist, plump raisins or finely chopped moist plump dried apricots( I poured hot tap water over my raisins and let them sit for a few minutes to plump up, then drained well). Center your rack in the oven and preheat oven to 350. Line baking sheet with parchment paper. 1. Sift together, flour, cocoa, salt and baking powder. 2. Set a heatproof bowl over a pan of simmering water. Add butter pieces, bittersweet and unsweetened chocolate and heat, stirring occasionally, just til melted. The chocolate and butter should be smooth and shiny but not so hot that the butter separates. Remove bowl from heat and set aside to cool. 3. 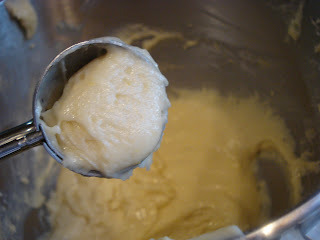 With standing mixer and paddle attachment ( or with a hand mixer in a large bowl), beat the eggs and sugar together on medium high speed about 2 minutes, til they are pale and foamy. 4. Beat in the vanilla, then scrape down the sides of the bowl. 5. 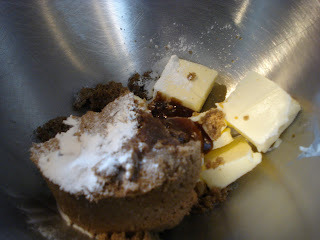 Reduce mixer to low speed and add the melted chocolate/butter mixture, mixing only til incorporated. 6. Scrape down the bowl, then on low speed, add the dry ingredients. 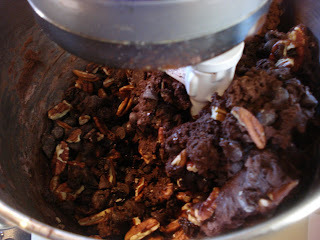 Mix just til the dry disappears into the dough, which will be thick, smooth and shiny. 7. 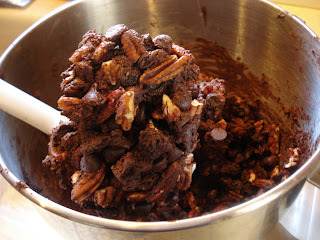 With a rubber spatula, mix in the semisweet and milk(or white) chocolate chunks, nuts and raisins. The mixture will be very chunky! 8. Drop the dough by generous rounded tablespoonfuls onto your baking sheet, about 1" apart. Using slightly dampened fingers, form each mounds into a somewhat round shape and flatten slightly with your fingers. 9. Bake 10 to 13 minutes, checking after 11 or 12 minutes. Repeat with remaining dough, baking one sheet at a time and cooling the sheets between batches. Let cookies cool on sheet about 5 minutes, then transfer to wire rack to cool completely. 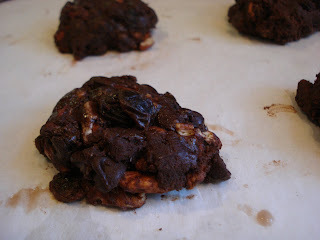 If you find the chocolate still gooey, and you'd like it to be firmer, pop the cookies intot he fridge for 10 minutes. 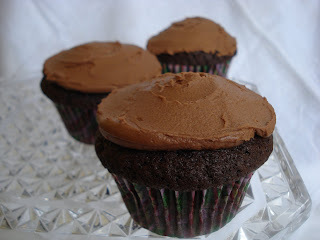 It's very dangerous to be stuck inside during a snowstorm and decide to make Chocolate Mocha Cupcakes! Very dangerous! But with Valentine's Day coming up, I needed to test out a new cupcake recipe. This weekend will be all things chocolate..and heart shaped! I found this recipe in an older issue of Taste of Home Magazine from 2007. It was the winning recipe for a cupcake contest and it's very good but I gave it a little more mocha flavor in the frosting. After I made the first batch..half batch actually, (I don't need to be stuck inside with too many cupcakes! ), I decided to try a Martha Stewart recipe. Her one bowl chocolate cupcake recipe I thought might give a good comparison and that's the Martha one on the left below with the Mocha one on the right. Martha's uses buttermilk, which I like in a chocolate cake recipe, however the Taste of Home recipe uses cider vinegar, which, I guess, really gives the same result. 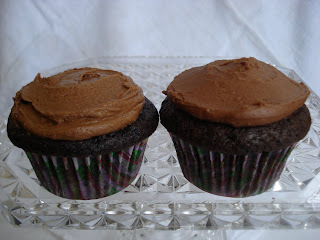 I used the same Mocha Frosting recipe for both. I did like the Taste of Home winning recipe. But Martha's was more moist and not as dense as the other. I think her cupcake was more moist because she used buttermilk, water and oil and Taste of Home used more oil but no buttermilk or water. A matter of preference, I think, on which one you'd considered to be better. This would have also been good with some kind of filling piped into the center, too. A little over the top, you say? Yeah, I'm already in trouble with having a dozen cupcakes hanging around until the snow stops falling..which doesn't look like any time soon! Preheat your oven to 350 now because this recipe goes together very quickly. Begin by mixing the dry ingredients in a small bowl. And stir or whisk to combine. 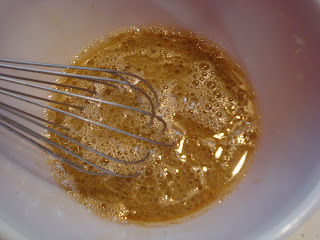 In another small bowl, whisk the eggs, coffee, oil, vinegar and vanilla. And pour the wet into the dry mixture and mix well. Place paper liners into muffin cups and spoon batter into cups, 3/4 ths full. Bake and cool, then make the frosting but microwaving the chocolate chips to melt. Stir the til smooth and add the butter and beat. Gradually beat in confectioners sugar and coffee. Stir to get it all smooth. Now , if you're handy with a piping gizmo ( which I'm not! ), you can go ahead and show off your creative piping skills. However, if you're like me, just plop some frosting on top of the cupcake and spread it around with a knife. I didn't have any chocolate sprinkles but the original recipe calls for decorating the top with these. I'm thinking maybe there needs to be something red on top for Valentine's Day. Maybe some red heart sprinkles. After we dig out, I'll go get some! Do you think I stopped at one bite? 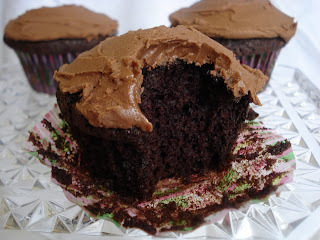 Chocolate Mocha Cupcakes ( adapted from Taste of Home Magazine). Preheat oven to 350. Place paper liners into muffin cups. 1. 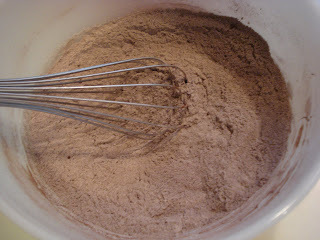 In small mixing bowl, combine flour, sugar, cocoa, baking soda and salt. 2. In small bowl, whisk eggs, coffee, oil, vinegar and vanilla. 3. Add wet to dry ingredients and mix well. 4. 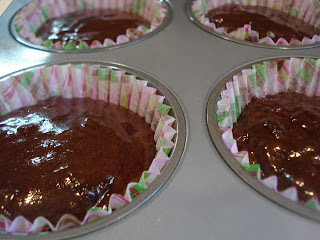 Fill paper lined cups 3/4 full and bake 20 - 25 minutes or til toothpick comes out clean. 5. Cool in pan 10 minutes, then move remove to wire rack to cool completely. In small microwave safe mixing bowl, melt chips, stir til smooth. Add butter and beat til blended. Gradually beat in confectioners sugar and coffee. Pipe frosting onto cupcakes. Top with sprinkles.